Well, this is an exciting bit of news for green drivers. Envia Systems has come up with a new battery technology that could give a $20,000 electric car a range of 300 miles to a charge. Yes, please? 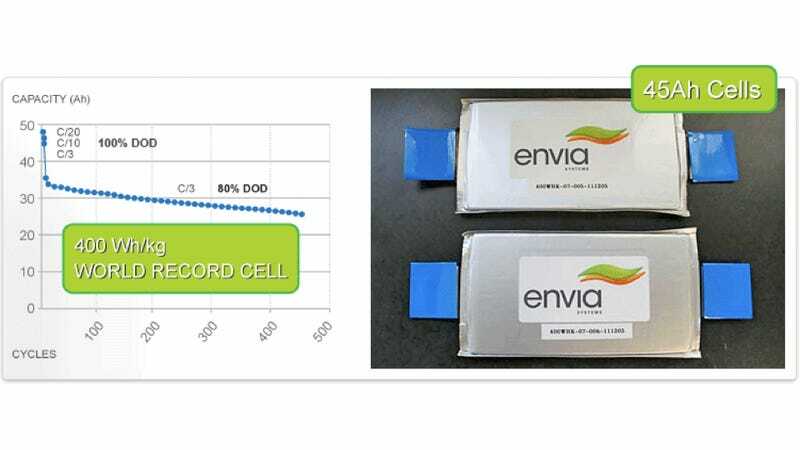 The General Motors-backed Envia Systems has come up with a new process that creates a battery with an energy density of 400 watt-hours per kilogram. To put that in perspective, the lithium cells found in most electric cars today only pack about 100-150 Wh/kg. Even the batteries on Tesla's forthcoming Model S only pack in around 240Wh/kg. In terms of cost, when it was first produced, the Nissan Leaf's battery cost around $375 per kilowatt-hour. The Envia battery is projected to cost just $125 per kilowatt-hour. The new magic comes from combining a "High Capacity Manganese Rich (HCMR)" cathode and a silicon-carbon nanocomposite anode, and then passing the lithium ions though a new, secret electrolyte formula (Powerade? Probably Powerade) that allows for increased voltage.